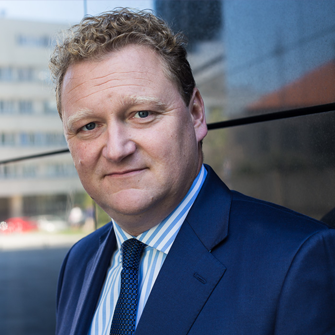 Hadley Dean, former CEO of EMEA Compass Offices and Colliers International EMEA board member overseeing Colliers teams in Eastern Europe, has been appointed Chief Executive Officer of Echo Polska Properties. He will assume his duties immediately. Echo Polska Properties (EPP), with assets worth 1.2 billion Euro, is owned by Redefine Properties and Echo Investment. EPP controls commercial assets previously held by Echo Investment Group and is going to operate on a formula similar to an REIT, with a strategic goal is to further extend the portfolio with attractive commercial assets. Hadley Dean has over 20 years of real estate experience, having worked in London, Warsaw, Central Europe and recently in Helsinki. He holds a diploma from Sheffield Hallam University in property valuation and management as well as BSC from Newcastle University. He spent 13 years living in Poland whilst working at Colliers International, helping building its business and then running Central and Eastern Europe operations. He is a Member of Royal Institute of Chartered Surveyors. “I’m looking forward to focusing on Poland and developing this exciting business into an investment platform that will be regarded as Poland's national champion,” said Hadley Dean. He is 44, married, with five daughters. Redefine Properties Limited a South African REIT, is one of the Top 40 companies listed on the Johannesburg Stock Exchange. It manages the assets worth 65 billion ZAR (ca. 4 billion EUR). The company has been quoted on the Johannesburg Stock Exchange since 2000 and has been systematically increasing its value since. The company’s portfolio includes office, retail and industrial assets. Besides South Africa, the group is present on the Australian market, where it is an important shareholder of Cromwell Property Group, listed on the Australian Stock Exchange, which controls Valad Europe, a company investing in retailindustry- service assets, among others in Poland. Furthermore, Redefine invests on the German and British markets through Redefine International PLC – a fund quoted on the London Stock Exchange. Echo Investment SA is among the largest investment and development companies in Poland. It carries out investments in four main sectors of the real estate market: residential buildings, shopping as well as shopping and entertainment centres, office buildings, and hotel properties. Since 1996, it has been listed on Warsaw Stock Exchange. The company has completed over 120 projects in several dozens of Polish cities, with a total area completed approximately 1,300,000 sq. m. In 2015, Echo Investment SA joined the dynamically developing capital group of Griffin Real Estate – Oaktree – PIMCO. The portfolio of Griffin Real Estate includes many commercial properties and investment plots located in all major Polish cities. Moreover, the company owns and manages the largest portfolio of student houses in Poland. In addition, it supports several social initiatives, including Jan Karski Educational Foundation. Griffin’s properties are often used as scenes for the artistic projects initiated by Griffin Art Space, an institution formed to support and promote art.